We are a leading Manufacturer of interior perforated sheets from Pune, India. With our expertise in this domain, we are able to manufacture, supply and export a superior quality range of Interior Perforated Sheets. The range we offer is manufactured by our expert professionals using high-grade material. In compliance with international quality standards, all our products are available in variegated specifications at industry-leading prices. 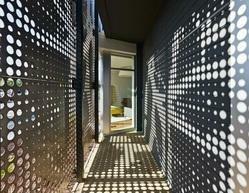 Looking for Interior Perforated Sheets ?